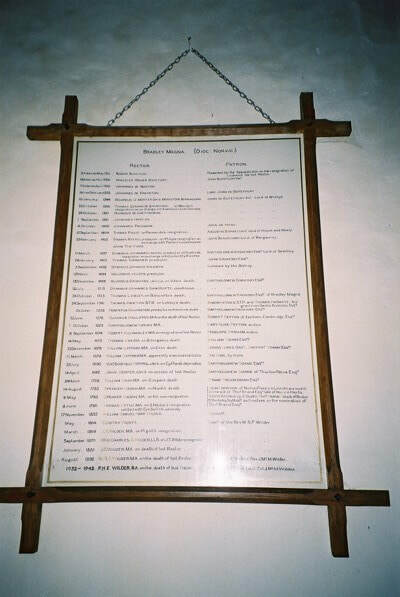 The list of Rectors, the dates they served and the Patrons are listed for over 700 years, from 1311. The information is contained on two framed scrolls at the back of the nave, either side of the Organ. The names are shown below, complete with the variations in spelling that appear on the original scrolls! Simon Heynes S.T.P 4. and Thomas Hadweye, by grant from Bartho Brokisby Esq. Robert Peyton of Iselham, Cambridge Esq. 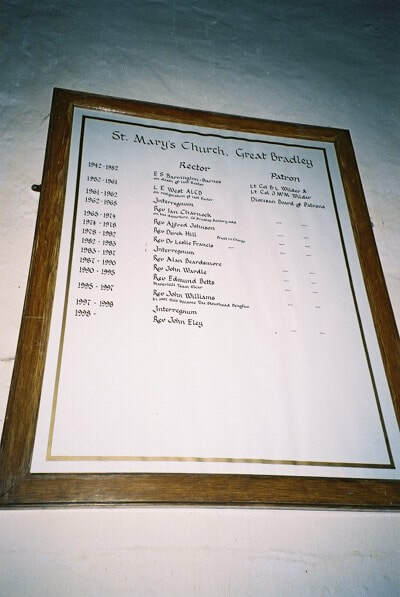 We were pleased to receive this information in 2011 from Alan Boswell: Your list of rectors in the nave of St Mary's includes my 6-great grandfather Bartholomew Adrian MA. His patron is shown as the Lady Alice Peyton. In 1623 Lady Alice was the widow of Sir John Peyton Bt., MP for Cambridgeshire. But there is a family connection through Bartholomew's wife, also called Alice, the daughter of John and Jane Welby. Lady Alice Peyton and Jane Welby were sisters, daughters of Sir Edward Osborne, Lord Mayor of London 1575-76 and his wife Ann. Bartholomew Adrian and Alice Welby were married in 1623, the same year as his appointment at St Mary's. So Lady Alice Peyton appointed her young niece's husband Bartholomew Adrian as Rector of Great Bradley. Bartholomew and Alice had a son, Richard, 1630-1715, who became Vicar of Naseby. Robert Billingsley M.A, on resignation of last rector. Cervas Elwes Bart. Bartholemew Soames Esq. Bartholemew Soames of Thurlow Parva Esq. Robert Archbishop of Dublin Thos.Brand Hollis of Braton St. Berkeley Sq. Middx. As trustees on the nomination of Thos.Brand Esq. 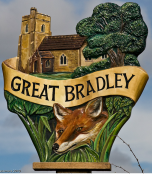 1.Bradley Magna = Latin for Great Bradley. 2. The parish was originally in the Diocese of Norwich until 1837 when part of the archdeaconry of Sudbury was transferred to the Diocese of Ely. now being called the Diocese of Ely. In 1914 the Diocese of St Edmundsbury and Ipswich was formed. A cold Victoria after being in the church to transcribe the information !